You know that a sentence in English should have a subject and a verb. 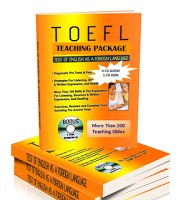 The most common types of problems that you will encounter in the Structure section of the TOEFL test are related to subjects and verbs; perhaps the sentence is missing either the subject, or the verb, or both; perhaps the sentence has an extra subject or verb. ______was ringing continuously for hours. In this example, you should notice immediately that there is a verb, was ringing, but there is no subject. Answer (C) is the best answer because it is a singular subject that agrees with the singular verb was ringing. Answer (A), loudly, and answer (B), in the morning, are not subjects, so they are not correct. Although answer (D), bells, could be a subject, it is not correct because bells is plural and it does not agree with the singular verb was ringing. Newspapers _______ every morning and every evening. In this example, you should notice immediately that the sentence has a subject, newspapers, but that there is no verb. Because answer (B), are delivered, is a verb, it is the best answer. Answers (A), (C), and (D) are not verbs, so they are not correct. The plane __________ landing at the airport in five minutes. This sentence has a subject, plane, and has part of a verb, landing; to be correct, some form of the verb be is needed to make the verb complete. Answers (A) and (B) are incorrect because the sentence already has a subject, plane, and does not need the extra subject it. Answer (C) is incorrect because descending is an extra part of a verb that is unnecessary because of landing. Answer (D) is the best answer; will be together with landing is a complete verb. A sentence in English must have at least one subject and one verb. The first thing you should do as you read a sentence in the Structure section of the TOEFL test is to find the subject and the verb. Underline the subjects once and the verbs twice in each of the following sentences. Then indicate if the sentences are correct (C) or incorrect ( I ). The subject of the sentence above is My best friend, but there is no Verb. So, incorrect. The correct sentence should be My best friend is always helpful and with problems. The subject is The bus and verb is has changed, so the sentence is Correct. The sentence doesn't have a Subject. The verb is dropped, so it is incorrect. The correct sentence should be Accidentally she or he dropped the glass on the floor. It should be The customer is paying the clerk for the clothes. The sentence doesn't have subject. The verb is practiced. So incorrect. It should be Each day they practiced the piano for hours. The sentence has subject, The new student, but no verb. So incorrect. The correct sentence can be The new student in the class is very talkative and friendly. The sentence doesn't have a Subject. It has main verb, walking but without tobe. So incorrect. Students take many problems in the time when you have to make a difference in between subjects and verbs. That writing essay uk difference is make to create a differ work and its also help us to increase our skills of working.